Another round of heavy rain pushed through North Texas Wednesday morning. A Flash Flood threat remains in place for areas east and southeast of DFW. Wednesday afternoon will offer a break in the rain before more showers develop overnight and Thursday morning. Scattered showers will again be possible Friday. A 20 percent chance of showers now exists for Saturday. Powerful storms dumped heavy rain on parts of Texas, Arkansas and Oklahoma Tuesday, causing flooding that led to a school bus rescue, property damage from multiple tornadoes and the death of a boater whose canoe capsized in strong winds. By the time the storm system leaves Texas and Oklahoma later this week it could dump up to a foot of rain on some areas, said National Weather Service meteorologist Jennifer McNatt. Most of North Texas is under a Flash Flood Watch until 6 p.m. Wednesday. Flood and Flash Flood Warnings issued for Collin, Dallas, Denton, Henderson, Hunt, Navarro, Parker, Rockwall and Wise counties have expired. Up to 7 inches of rain is expected through Wednesday and up to 12 inches by the end of the weekend in some parts of Texas. In Arlington, high water forced the closure of multiple parks near creeks or the Trinity River, including the Village Creek Historical Area, Tuesday afternoon. The parks have not yet reopened. As of 11 a.m., 33 flights were canceled and 180 were delayed at Dallas/Fort Worth International Airport. Three flights were canceled and 14 were delayed at Dallas Love Field. Garland residents whose homes were damaged by December tornadoes worked ahead of Tuesday's storm to repair roofs and windows. Not all of the repairs were finished in time, though, and rain poured into several homes in a neighborhood south of Interstate 30. An EF-1 tornado — confirmed Tuesday evening by the National Weather Service — caused damage to four mobile homes and injured four people in the community of Tolar, Hood County Sheriff Roger Deeds said. Powerful winds damage sections of Northwest Tarrant County, including several storage buildings near Lake Worth Tuesday morning. 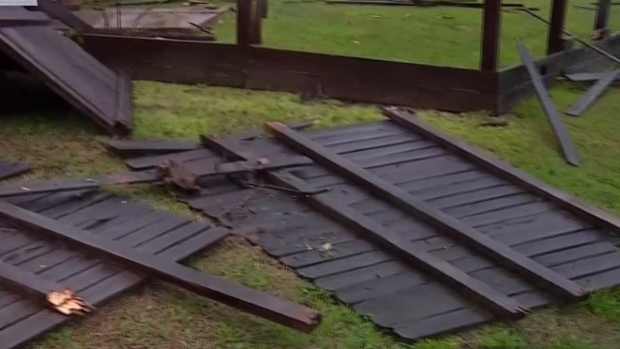 The NWS also confirmed Tuesday that an EF-1 tornado touched down in Stephenville earlier in the day. The NWS attributed much of the storm damage in Stephenville to straight-line winds, but did say a narrow EF-1 tornado hit the area. 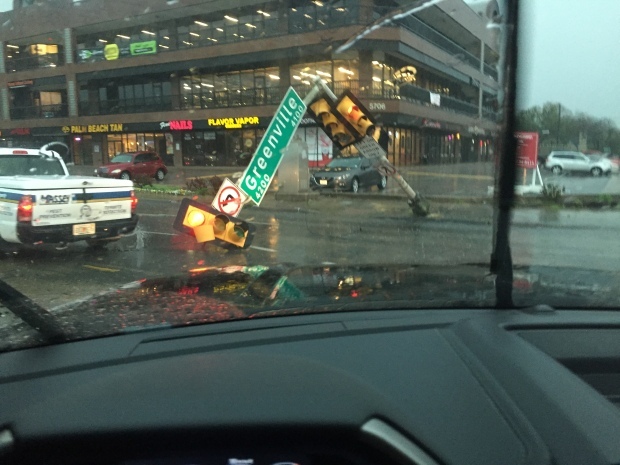 An EF-1 tornado has top winds between 86 and 110 miles per hour, according to the NWS. High water forced the closure of several low-lying roads, including the frontage roads to Interstate 35E in Denton County between McCormick and Underwood streets. Those frontage roads were reopened to traffic before the afternoon rush hour. Heavy wind and rain caused power outages and damage to several schools in Tarrant County. A strong wind gust ripped off a panel of bricks from the student union at the northwest campus of Tarrant County College, and flying debris damaged a number of vehicles at Chisholm Trail High School and Brewer High School. Two power poles snapped in half Tuesday morning during a storm that swept through Richardson, knocking out power to the immediate area. Dallas-based utility Oncor at one point reported more than 40,000 customers without power Tuesday as strong winds brought down power lines, trees and traffic lights. Winds of up to 70 mph were reported and tornado warnings were issued for parts of central and eastern Texas. 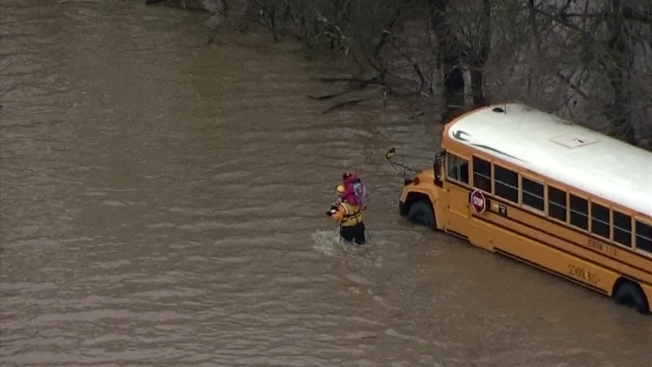 Emergency personnel waded through thigh-deep water to rescue six children from a school bus caught on a flooded road north of Fort Worth. McNatt said that in addition to flash flooding, there's widespread river flooding, but the damage isn't expected to be extensive. "We've had a relatively dry January and February, so the lakes aren't full and the rivers aren't as full, either," she said. The weather service issued a flood advisory for the Illinois River near Tahlequah, in eastern Oklahoma, cautioning that the river could rise to 10.9 feet by Friday — with flood stage on the Illinois at 11 feet. 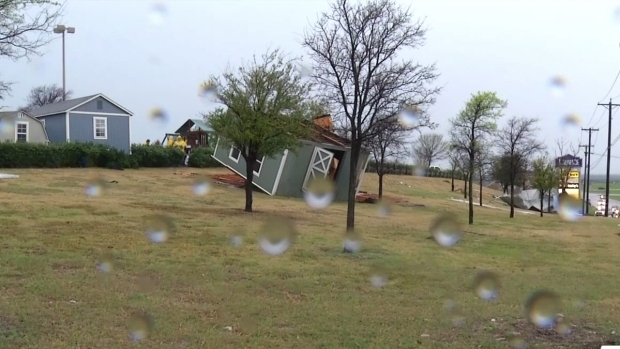 Storms damage homes near the border of Collin and Denton counties in the town of Little Elm Tuesday morning. The Poteau River near the town of Panama, which runs through Arkansas and Oklahoma, could also flood, the weather service said. Flood stage for the river is 29 feet and the rains were expected to cause the river to reach 32.7 feet by Thursday. Pete Snyder, a meteorologist with the weather service in Tulsa, said the storm system "is somewhat meandering," producing the chance for more rain through the rest of the week. "The storms are not that much severe here because of where the low is located, but there could be several strong storms that sneak into the area, but for the most part it's going to be a heavy rain," Snyder said. In northwestern Arkansas, heavy rain was expected to begin Tuesday evening and last through early Friday, with up to 8 inches possible west of Little Rock. The service said minor to moderate flooding could occur on the Ouachita, Little Missouri, Fourche LaFave, Petit Jean and Saline rivers. 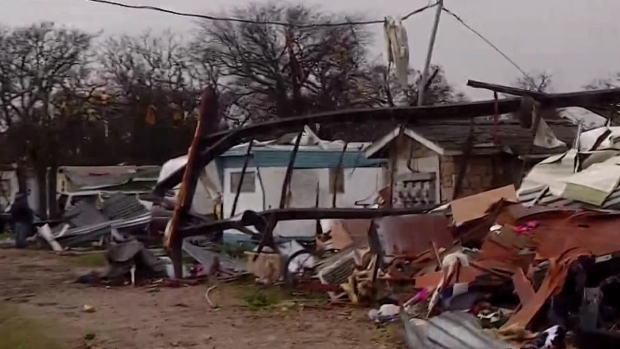 Storms strike Hood County Tuesday morning, destroying half the homes in a mobile home park in Tolar. Authorities near Houston said they've recovered the body of a 22-year-old man whose canoe capsized as he and another man were fishing in a bayou near Galveston Bay. The system is unrelated to one that brought powerful thunderstorms to much of California on Monday, walloping the Sierra Nevada with blizzard conditions and briefly knocking out power at the Los Angeles airport.